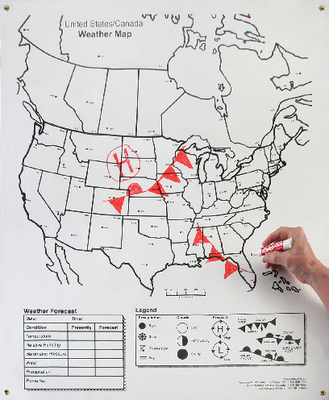 This updated chart can be used with dry erase markers for plotting weather from key cities in the North American continent. The large size makes it suitable for use with the entire class and the four corner grommets make it easy to hang and display. The chart and maps include forecast information as well as a legend of standard weather symbols. Individual student maps are weather bureau type and are provided in packages 100. Chart size: 36" x 45". Map size: 8" x 10 1/2".